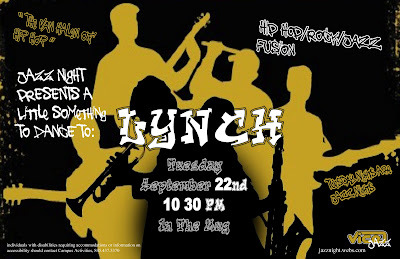 Tonight's ViCE Jazz Night will feature LYNCH at 10:30 in the Mug. "LYNCH is a song structured improvisational fusion of hip-hop, rock, and jazz... flirting with many styles from drum and bass to latin and reggae. There isn't a crowd Lynch can't rock. It's no wonder the band is being called the "Van Halen of hip-hop."